MSU BILLINGS NEWS SERVICES — In partnership with the Montana State University Billings Library, The Writer’s Voice will introduce Montanans to the writing of Emily St. John Mandel through a dynamic collaboration among the university faculty and students, Billings Public Library, area high schools, and Billings community. The program is also supported by Yellowstone Public Radio. The Writer’s Voice is once again hosting the NEA Big Read in Billings this spring. A program of the National Endowment for the Arts, the NEA Big Read broadens our understanding of our world, our communities, and ourselves through the joy of sharing a good book. 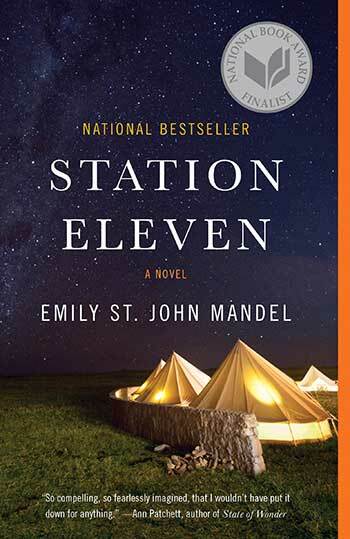 The NEA Big Read in Billings will focus on Mandel’s book, Station Eleven. The critically acclaimed novel won the Arthur C. Clarke Award, was a finalist for the National Book Award and PEN/Faulkner Award, and was named one of the best books of the year by more than a dozen publications. Events begin January 17, with the opening of an art exhibition, This Vibrant, Tarnished World, by Jennifer Eli French in the Northcutt Steele Gallery at MSU Billings. The exhibit is inspired by the futuristic novel, Station Eleven. The public is invited to pick up a free copy of the book at the MSUB Library and sign up for a discussion group. Sixteen book discussions are scheduled at various times, dates and venues; information is available here. Discussion groups begin January 29. Books will also be available at the Billings Public Library, This House of Books, and the art exhibition. A national initiative of the National Endowment for the Arts in partnership with Arts Midwest, the NEA Big Read broadens our understanding of our world, our communities, and ourselves through the joy of sharing a good book. The Writer's Voice was founded in 1991 to provide access to the arts in non-traditional communities and opportunities for active engagement between writers and audiences. For more information about The Writer’s Voice contact Corby Skinner at 294-2390 or Corby@skinnerbenoit.com. All events will be held on Tuesday and Thursday evenings, 6:30pm in L.A. 205, Montana State University Billings, except where noted.